In deep prayer we are aware of our connection to God. We are restored to the wholeness of mind, where we can see, know and experience perfect health. We see who we were before healing was needed. When I go into my praying meditation, I hold your name to my heart, and bring it up to my awareness of God. 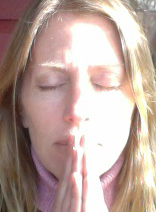 When deep in this prayerful trance, a part of my mind can see you before your healing was needed. In this state, I see only that healthy picture of you, and no other. I think of it like seeing through the lens of God, which means seeing you as God sees you: totally perfect and whole. God made you, and therefore knows that you are perfect and whole, and when I am able to see you that way in my meditation -- even if you can't see yourself that way, yet -- your healing is assured. Healing occurs when anyone (in this case, I) recognize your perfection in the sight of God. With every healing I am acknowledging that God is everywhere and all powerful. I'm not saying that I am God, or that God works exclusively through me. My training in seminary taught me that if I can see as God sees, and feel as God feels, then all I will see and feel is the perfection of His children and His creations. We can all do this. We can all look past the personality and ego, past the sickness or disability, past the anger or depression -- if we do this, we can see a perfect child of God. When we see this perfection, we reflect it right back to the person we're looking at, so he can know it and experience his wholeness and perfection, too. That is how the power of prayer works, and there is no order of difficulty in healing when using spiritual energy. And it does work, but unless the healer heals through God, the results will vary. Every loving and healing thought I have for one person belongs to every person, because we are all connected. Letting me include you in my healing prayers will bring healing for the whole world. I've spent many years working as a hypnotist, helping people use the power of their minds to overcome destructive habits, addiction, overweight and emotional troubles. I have personally used the power of my mind to overcome an eating disorder that no other traditional medical intervention was able to relieve. When we use our minds with focus and attention, we have a greater chance of bringing an expectation into reality. In other words, we get what we focus on. If I focus on how uncomfortable, sick, or disabled I am, discomfort, sickness, and disability is going to be my reality. Studies have shown that this applies not only to ourselves, but to those we're thinking about. If I worry constantly about a loved one's health, and focus on all the things that could go wrong with her, she is more likely to experience challenges. The opposite is true, too. When I hold loving, healthy thoughts of a person in my mind, she is more likely to experience quick recovery, less pain, and an upbeat emotional state. Remember, if the mind can heal the body, but the body cannot heal the mind, then the mind must be stronger than the body. In my daily prayerful meditations, I have the mental expectation that every name I hold close to my heart will experience healing. Mentally, for me, there is no other outcome. Quantum physics tells us that once two packets of energy (people, for instance) have interacted, they are forever afterwards entrained and connected, despite time and distance. For example, imagine two adjacent molecules are separated; one stays in a lab in Ohio, and the other is sent to a lab in California. When a lab technician alters the molecule in Ohio, the molecule in California will register a change as well (on an energetic level). When I receive your email, I connect closely with the name of whoever needs healing. I bring it into my energy, my thoughts and heart and feelings. We are then entrained, even though your loved one is far away. Going into my deep prayer, I bring myself up to the highest awareness of connection with God -- of my own perfection as His daughter. Your loved one comes with me, and is positively affected by my high frequency and good health. In these three ways, I bring healing to you or your loved one. The results are miraculous. In healing you, I bring healing to myself and to all the world, and for this I thank you!